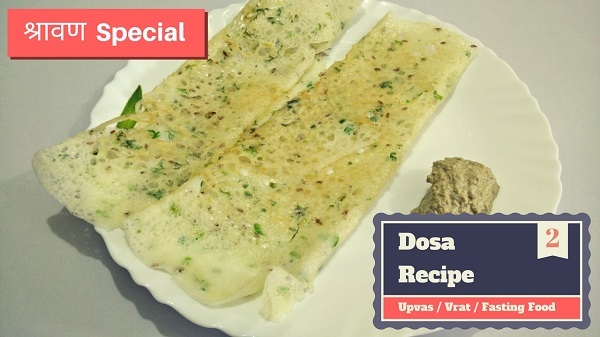 Upvas Dosa or Farali Dosa made from Tapioca Sago (Sabudana) & Barnyard Millet (Moraiyo) is a Fasting Food recipe made during Fasting days like Holy Month of Shravan or Navratri. Very easy to make and very tasty dosa served best with Upvas Peanut Chutney. Soak Sabudana & Moraiyo in water for 6 – 8 hours. First of all, grind soaked Sabudana and Moraiyo together in mixer grinder & prepare smooth Batter. Add 1 cup water to make it as liquidy as Rava Dosa batter, mix well. Now add grated Ginger, chopped Green Chillies, Cumin Seeds, fresh Coriander. Finally, add Salt and mix well all ingredients. Upvas Dosa Batter is now ready. Heat dosa pan over high flame. Sprinkle some water on hot Tawa and wipe with a dry cloth before pouring the Batter. Pour a ladle full of batter on hot Tawa and spread evenly in a circular shape. Cook Dosa on low to medium flame. Add some Ghee and spread evenly to make crispy Dosa, cook till it turns crispy & golden brown. Remove from the pan and prepare more Dosa in the same way. Serve Farali Dosa with Peanut Chutney. You can skip Ginger & Coriander if you don’t eat during Fasting Days. Watch 20+ Upvas / Vrat / Farali Recipe videos on my YouTube Channel Cooking with Smita. 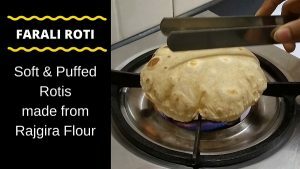 Click here Fasting Food Recipes Playlist.